You Can't Solve This 'Rubik,' But It'll Still Make You Feel Smart Elizabeth Tan's novel jumps between different characters and timelines, beginning with the death of the main character and only getting weirder — but there's a true heart underneath the cleverness. There are two kinds of extremely smart books: The ones that make you feel small and stupid, as if the author is telling you how far above you their intelligence lies, and the ones that makes you feel smart reading them, that demonstrate the author's respect for her reader. 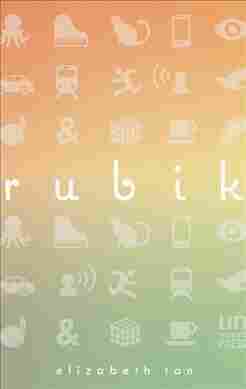 Rubik, the debut novel by Australian writer Elizabeth Tan, is the best example of the second kind. It's the kind of book that reminds you of nights — and they are somehow always nights — when you discussed Big Concepts like Life and the Universe and Reality with your friends, and fell asleep with your mind gently buzzing. Rubik is a novel in stories of sorts, its chapters moving between different characters, timelines, and realities like a written mix of anime, The Matrix, and Inception. It starts clearly enough, with Elena Rubik, a 25-year-old woman living in a shared flat in Perth with her best friend Jules Valentine. Specifically, it starts with the night Elena dies, in May of 2011, two months before her birthday. It isn't the true beginning of the story being told, because that story doesn't have an exact origin. But with any story, you have to start somewhere, and Elena Rubik's death is as good a place as any. From that death we're catapulted out into a world full of characters, some real within the book's reality, some fictitious within it, and that's one of the greatest joys of the book's intelligence — that it is playful. One chapter describes the first episode of an anime called Pikkoro and the Multipurpose Octopus, which, for anyone who has watched anime, is hysterically reminiscent of certain tropes of the genre, from the octopus tentacles to the haphazardly futuristic qualities of some but not all of the technology. Pikkoro becomes a constant reference point for Tan's characters — some writing fanfiction of it, others remembering it as a favorite television show, still others merely suffering in silence as someone else talks about it. This kind of memetic quality is all over the book, and is, in fact, one of its main themes. Memes are a huge part of modern life, whether in their original definition as an element of culture or behavior passed along through imitation, or in their more recognizable form as images morphing humorously or philosophically online. Tan leans into this in the book, allowing characters to mutate and change through the different stories and points of view, though they always remain recognizable, so that we have an a-ha! moment whenever they appear, but still need to wait and see what this version is like. Jules Valentine is the primary example of this, and for good reason: In her first chapter, early in the book, Jules becomes the original image of "the falling girl." This is an image used by the book's only real antagonist, a tech company named Seed, as part of a famous marketing campaign, and its first appearance also shows off Tan's incredible writing chops: "Falling, she is the tensile arch of a fermata poised above stave, a notation to sky — she is the equation of 3x to the power of two, her landing scatters coordinates — italicised by momentum — legs half-jacked — spiked with gravity, she invents a new axis — nobody will ever be able to say what was so compelling — some will attribute it to the filmmaker, some to her particular electricity." Whatever it is that makes the image of Jules electric, she becomes the meme she has created, going from a regular post-college millennial to a strange eyeless agent whose role in some bigger conspiracy is opaque even to her. ... the novel isn't all wordplay and clever conceit — it has a true heart, and many of the characters are achingly full of pathos. But the novel isn't all wordplay and clever conceit — it has a true heart, and many of the characters are achingly full of pathos, like the receptionist at a mysterious company who spends his time at work sincerely — and, at the same time, ironically — answering spam emails attempting to sell him Seed products. Or the young boy, a third-grader, who dearly wishes to please his oppressive parents by learning to play the piano well, but who wishes even more for a friend. At one point, this boy "feels a bottomless kind of sadness, an ache that feels good and bad at the same time, that sort of bothness that adults never talk about, oversimplify, like erasing strokes from a drawing." This is such a simple observation, yet so incredibly familiar and astute, and Tan's book is full of such gems. Whatever your jam is — mind-bending logic, beautiful, lyrical writing, or a deep dive into contemporary life — there is something brilliant here for everyone. Ilana Masad is an Israeli-American fiction writer, book critic, essayist, and editor for hire.